The structure indicated is the vestibulocochlear nerve (cranial nerve VIII). The vestibulocochlear nerve consists of a vestibular branch and a cochlear branch. The vestibular branch is responsible for balance, and the cochlear branch is responsible for hearing. It originates laterally in the cerebellopontine angle and passes together with the facial nerve into the internal acoustic meatus of the temporal bone. Bipolar sensory neurons in the organ of coorti pass impulses from the hair cells of the cochlear via the peripheral axonal process to the spiral ganglia (this is the collection of cell bodies of the cochlear nerve and it is located within the cochlear) and from these ganglia the impulse then travels via the central axonal process to the cochlear nucleus in the brainstem. Fibres then project from the cochlear nucleus to the inferior colliculi, the medial geniculate bodies and then via the internal capsule to the auditory cortex located in the temporal lobe. Bipolar sensory neurons convey impulse from the vestibular hair cells located in the utricle, saccule and semicircular canals to the vestibular ganglion. The vestibular ganglion is located inside the internal auditory meatus. 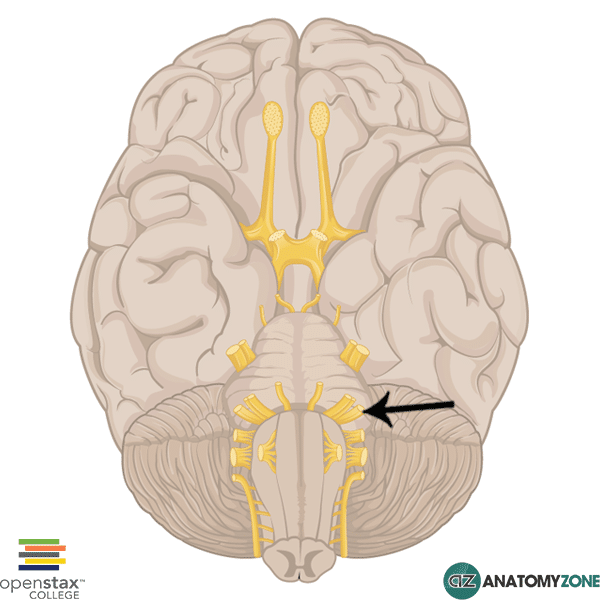 From here, fibres pass either to the cerebellum or to the vestibular nuclei located in the brainstem. Learn more about the anatomy of the cranial nerves in this tutorial.